>> CHECK BACK FOR FUTURE EVENTS. Join Congress Member Alan Lowenthal, Mayor Robert Garcia and Councilmembers to honor and celebrate our community-based organizations and community members in recent victories with the passage of the Independent Citizen’s Redistricting (Measure DDD), Democratic Party Assembly Delegates, and discuss future opportunities. Equitable Redistricting For Cambodians – we are diverse people and residents of Long Beach. We support equity, equality and basic rights for the residents. We welcome all friends and residents. Currently Cambodia Town and the surrounding community are divided between four Council Districts including District 6, District 4, District 2 and District 1. This division dilutes our voting power. We, the undersigned residents and friends of the Cambodian community, hereby demand that Cambodia Town and the surrounding community be made part of one Council District in time for the 2020 Election. Launch Party for signing the petition to support community equity for an ethnic group, Cambodian community. Look forward to seeing you on Saturday, March 18th at 6pm for our Campaign Launch Party! "In 2011 the Long Beach City Council oversaw the redistricting of Long Beach pursuant to City Charter mandate that Long Beach consider redistricting every 5 years and that typically cities redistrict every 10 years. Although the Redistricting Criteria which the Council adopted states that " Splits in neighborhoods, ethnic communities and other groups having a clear identity should be avoided," the 2011 redistricting split Cambodia Town between the 4th and 6th Council districts. For the past two months, students in the Civics, Organizing and Government (COG) class at the MAYE center have evaluated the history, politics and community cost of dividing Cambodia Town and the surrounding Cambodian community. In our opinion this dilutes the voting power of the Cambodian population, and minimizes our influence in a political process that controls resources and spending in Long Beach. The COG class believes that this wrong should be redressed through uniting Cambodia Town and the surrounding Cambodian population under one Council district. Since the Council is due to take this matter up again in 2021 or earlier, we believe that it is timely now to both demand that redistricting occur and that Cambodia town be united in one district. To that end, we are calling a meeting of the community to discuss the research and history on Long Beach redistricting and start a petition to our elected officials to move this process forward. A meeting has been scheduled for Saturday, January 20, 2018 at 2pm at The MAYE Center, 2153 E. Anaheim St.
We ask that you please attend and spread the word to members of our community asking that they join the COG class and others who have expressed an interest in this critical issue. A draft of the petition created by the COG class is attached. Please review and bring whatever suggestions you may have to the meeting. Of course, feel free to contact me directly in advance of this important meeting." 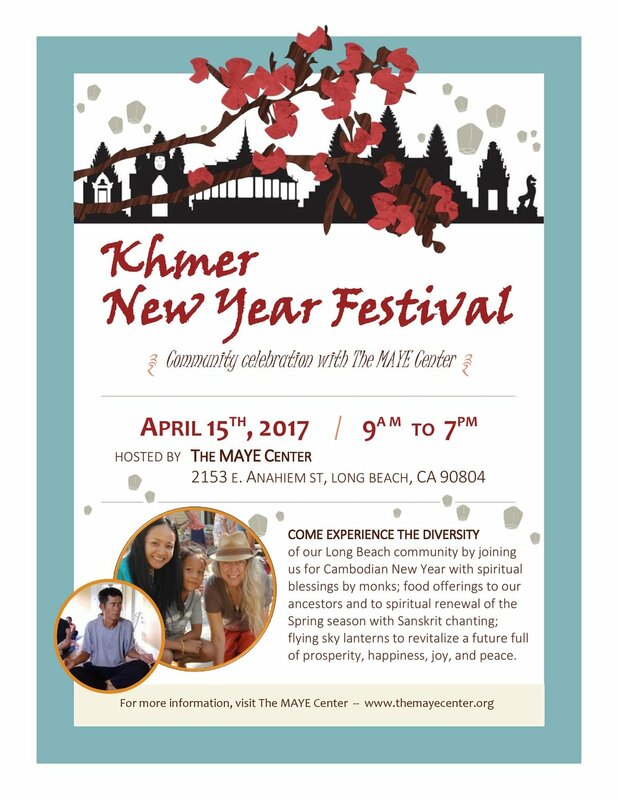 Come experience the diversity of our Long Beach community by joining us for Cambodian New Year with spiritual blessings by monks; exotic Khmer "garden to you" food offerings to our ancestors, and spiritual renewal of the Spring season; flying sky lanterns to revitalize a future full of prosperity, happiness, joy, and peace; and much more!